I am now in the last few days of my mission, and as I reflect on the multitude of experiences, both the difficult and the glorious, I am filled with immense gratitude for my Heavenly Father and my Savior, Jesus Christ. It has been such an incredible honor having the mantle of a missionary, being called by my Father in Heaven to preach this message of eternal happiness and peace to His children in France. I have been able to feel my Heavenly Father’s love for each person I have come into contact with and have come to a greater knowledge of the love that He has for me. As I have struggled and strived to be the best instrument I could be, my Savior carried me through the ups and the downs. I know, through the personal experiences I have had, and through the people that I have been able to teach and baptize, that the Atonement of Jesus Christ is real. It truly is. I still ask myself often how it is that still so many people would not come to take some time to learn and to accept this restored gospel when it can change their lives for the better. And for that, the mission will not stop here. I will still strive to be the best example that I can be and share the gospel for the rest of my life. Heavenly Father really did accord me some of the greatest experiences this final week. On Wednesday, we met a 22 year old Venezuelan man named Jesus-Alejandro, who was really searching for the gospel. He had already met the missionaries in Paris the week before, and had attended the young adult family home evenings (FHE) held in Paris. He had so many questions, and he had a sincere desire to simply know what God wanted him to do in his life. We set a baptismal date with him for August 23. There was a baptismal service in our ward for a mom and her daughter yesterday, and Jesus came to church and stayed till the very end. He could only tell us how happy he felt and how great he felt in church. He is so prepared. Not only did he come, but Guillaume and Alain, our other amis, came! We had a row full of our amis this week at church, and it was such a great end to my last french church meeting – to be just as the Savior was – bringing his sheep back to the fold. I was also fortunate to be able to visit Prisen this week, one of my recent converts from a year ago, and to see how strong he remained in the gospel. He is still as joyful and happy as ever, and he has grown so close to our Heavenly Father. 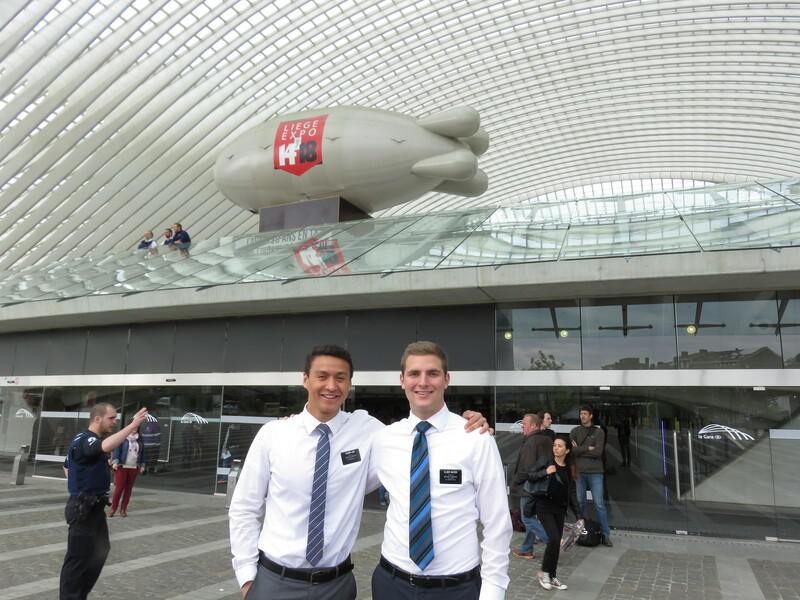 As a last spiritual thought, I was able to share my experiences on my mission and give him some counsel as he now prepares for his mission next year. Prisen is one of my greatest joys on the mission. He is the reason why missionary work is important and worth it, even if it takes lots of walking, lots of talking to people, lots of rejection and lots of fatigue. The worth of one soul is truly great in the eyes of God. Once again, I am so grateful for these sacred 2 years, what a blessing they have been. I am grateful for my Heavenly Father and my Savior, Jesus Christ – for their trust in me, and for the miracles that they let me be a part of. I am also thankful for my incredible family, who has supported me throughout my mission. There was never one week where I did not receive a letter from home. I know I have been blessed by the diligence and the faithfulness of my dearest mom and dad, who have tirelessly raised me in the best environment possible. I know that God lives, I know that Jesus is the Christ, I know that the Book of Mormon contains the fulness of the gospel and was translated through the power of God by a true prophet, Joseph Smith. I know that the power of God is restored on the earth again, and that through it, our families can be together forever. I love you all. Thank you all for all that you have done for me. Your prayers and thoughts have strengthened me greatly. A tres bientot mes amis! Je vous aime beaucoup. and proud to be a missionary. What an incredible week it was. I have been blessed with more and more beautiful experiences as I come to the final lap of my mission. every minute of this blessing I have to be a missionary. to place it in the middle of Paris, and to have the 20 missionaries in our zone contact people about the Book of Mormon and to hand them out. help place those who were ready for the gospel, we began. in God because he was really moved by the words in Lehi’s dream in Chapter 8 of 1 Nephi, and now wanted to be baptized. This conversion took just 30 minutes! There was even a man who I talked to who began saying that he was not interested, and then, after talking to him about his life goals and his personal spiritual experiences, he realized that he did indeed believe that God was there. We prayed with him and set an appointment to meet him again. So many incredible miracles happened during those few hours. Babins are for the mission, and the examples that they are. Well, that’s all the time I have for today. This is my second last email home, and I can’t wait to tell you all about the great experiences that the Lord will give me for this final week. The mission is a blast! Je vous aime tous et je suis content et ravi de pouvoir vous voir encore. Passez une très belle semaine avec pleine de miracles! For the first time in 60 years, the temperature in Paris got up to above 40 degrees Celsius, because of the winds from the Sahara that passed through this region in Europe. It was definitely the hottest weather I have ever been in, and in addition to the heat, the humidity made it an even greater challenge. We, nevertheless, continued missionary work as usual, taking a few precautions to stay hydrated, and taking a few minutes of refuge in the air-conditioning of supermarkets from time to time in the midst of long hours of contacting outside. In fact, this past week was one of my favorite weeks on my mission, because I felt like, during my exchanges with the Zone Leaders, and during my time with my companion, we really tried to push ourselves to see the miracles. the heat got a little unbearable at one point and with hungry stomachs, we considered heading home a little bit early to take dinner. But during our planning earlier that day, we felt that there was someone important to find and talk to, so we decided to stick it out, and follow the plan. As we walked and talked to people, it seemed that there was no one who was really receptive. Somewhere during those 30 minutes, I got a call from the office about some train ticket problems and had to advise Sister Seaman, one of the office couple missionaries, about how she could resolve it. A lady and her children walked past on the other side of the street just as I was talking to Sister Seaman, and I felt that we needed to head over to the other side of the street and talk to her. Elder Ricks had the same feeling. I told Sister Seaman later that I would call her back later, and we crossed the street to talk to the lady. It was incredible, because we told her that we just felt like we should talk to her and introduced ourselves, she smiled and said that she was actually very interested in knowing what we share. We talked to her about the Book of Mormon, and gave her a copy in the 5 minutes that she had time to spare. She was really happy to have spoken to us, and to have been able to find someone who was ready to listen really made a great difference. I knew that if we had decided to diverge off from our original plan and head back, we would not have met her. We will be seeing her sometime this week. I love you all, and I am grateful for the opportunity I have to be a missionary. I know that the Book of Mormon is the word of God, that the Priesthood power has been restored to the earth, with the power to bind our families together for eternity. Passez une tres bonne semaine! have fun going through the trials and difficulties of our daily lives. decision, she remained faithful and eventually did after her birthday. member of the church in his family, decided to go on a mission. first time the we will be introducing iPads to the entire mission. men to create. I’ll let you know when I find my first ami online. words to help some of Heavenly Father’s children in need. Je sais que Dieu vit et qu’il nous aime. A la semaine prochaine! So, I guess this is where the time on the mission starts feeling short. I am now in my 16th transfer on my mission, the very last one before heading home, and it is a little weird to imagine that I have already spent that much time on a mission, because being a missionary is no longer something that comes simply with wearing a plaque, it is practically who I am today. What jogged my mind to this reflection was seeing my Stake President from back when I was in the Stanford 1st Ward. President Wilson was the Stake President who did my interview before I submitted my mission papers. He used to live here about 20 years ago, and attended the Versailles ward – the ward that I am now serving in. President Wilson showed up last year when I was serving in the Paris St. Merri ward, and to have him here again was a great blessing. It reminded me of all the blessings and the progression that I have seen in myself since coming on my mission. Missions are great not merely because of the change you see in others, but also the changes that one sees in himself – a change to become more like Christ. This past week, was a week filled with planning for the upcoming transfer. With President and Sister Babin, we spent 2 days praying, thinking, and discerning with our best efforts where missionaries should go for the next transfer. It is always a difficult task because there are so many missionaries each with their unique strengths and needs, and coupled with the difficulties and dynamics of each sector of the mission, it is a delicate process. But I know that the Lord does have his hand in these decisions, and we always find the perfect solution with the help of the Lord. With that, we also came to a conclusion as to where I would finish my mission: I have the great privilege of finishing my mission here as an Assistant and to continue to work with the amis who I have grown to love during the past 4 transfers. I know that there is something special that I will have to do in these last 6 weeks, and I am excited to give my all to the Lord’s work in this last penultimate lap. One of the most special experiences I had this week was teaching one of our amis, Jennifer, who we have taught for the last 6 weeks. Because she has absolutely no religious base, teaching her is a little challenging because we have to ensure that we are using vocabulary that would help her understand. Often, we assume that everyone understands the jargon of the gospel, and often, we end up confusing people more than helping them if we are not aware. Jennifer has been progressing really well with her baptismal date for the 12th of July, and she told us that she has really felt a difference ever since she has gone to church. She said that she felt a profound sense of peace and even though she does not completely understand the gospel, she knows that Jesus Christ is real and that He loves us. This made me realise how important it is for us to feel more than think when we are trying to make huge decisions in our life with our Heavenly Father’s help. Answers always come through feelings, and it is by being honest and sensitive to what we feel, that we will understand what the road we have to take. I know that the Book of Mormon is true and I know that The Church of Jesus Christ of Latter-day Saints is the only church that contains the fulness of the gospel today. I am grateful to be a missionary. Many ups and downs this week. Elder Hall and I did exchanges with the Caen, Angers and Paris Zone Leaders, and as always, it was edifying being with some of the best missionaries in the mission. The mission is definitely a time of learning and reflection, and the most interesting part is that on a mission, one improves his relationships with our Heavenly Father, with others, and most of all, himself. I have learnt so many life lessons on my mission, and I can testify to the fact that there is no better way to learn that except being on a mission. I love the mission. For the experience I would like to share, it revolves around our ami, Alain, who we have been teaching, and he has been really good at keeping his commitments – coming to church, reading the sections of scriptures that we give to him at each appointment. Truly, he has progressed immensely over the last 6 months. The only difficulty for him was accepting the Book of Mormon to be the word of God. A testimony is a personal witness from our Heavenly Father through the Holy Ghost that something is true. Alain has been working slowly but steadily on gaining a testimony of the Book of Mormon, and while he has been able to accept all the commandments we have taught him thus far, the fact that the Book of Mormon had a very different style to the Bible, was something that bothered him. While he knew that the principles that were taught in the Book of Mormon were true, and while he found answers to his questions that he felt were from God, it was hard for him to accept that the Book of Mormon is the word of God. We fixed a baptismal date with him and he accepted, and since then we have really tried our best to make sure that the spirit was always strong as we taught. We took great care trying to plan our lessons well, using the scriptures that were just the right ones to answer his questions. We really worked on trying to listen to the Holy Ghost as well as we taught, so that we might ask him just the right questions that would help him recognise the answers that he felt from God as he read and applied the things we taught. Ever since we have started teaching him, the spirit has always been there and there was always a profound sense of peace and warmth as we taught. We were sure that he would have recognized that as his answer, because I knew that Jesus Christ was there with us. His baptismal date was drawing near and he decided that he needed to seriously inquire during the past week and receive a confirmation of the Book of Mormon. He came up to us yesterday, just before sacrament meeting to tell us that he decided that he was not going to be baptized because he had not still not received his answer. It was sad for me to hear that, simply because Elder Hall and I had done all that we could in our power and knew that he had received and answer, but was not able to recognize that. At the start of sacrament meeting, I felt a little defeated, wondering if there was anything more that we could do. Surely, God would have given him an answer as he had done for me. While the whisperings of the spirit were always gentle, the warmth and peace if I was willing to listen always testified that the Book of Mormon is true. There had to be more that we could do. An impression came to mind to ask him to pray again during the sacrament, to ask Heavenly Father, simply to give him an answer. I leaned over to him and asked him, “Alain, would you pray one more time to ask Heavenly Father during the sacrament? Be simple and listen to the first thought that comes to mind.” I did not ask him what his reply was after the sacrament was over, but quickly after, 2 speakers shared their testimonies about how they studied the Book of Mormon and the Bible, and how they gained their testimonies. The latter, who was a convert who went on to serve a mission in the Salt Lake Temple mission, shared about how she originally could not accept the Book of Mormon at first, because she had, until that time, only believed in the Bible. But, after she had sincerely prayed about it, she opened up to a scripture and it really touched her heart and gave her the answers that she was looking for. The testimony of the second speaker was perfectly for Alain, God really did send him an answer during that meeting. When we called him that night to ask him if we could still come over to teach us, he told us that he found it curious how the speakers that followed both spoke on the subject that he had a hard time with. He accepted to have us over to continue teaching him and to finish all the lessons. We will be seeing him tonight. We are going to try our very best to help him recognize his answers, but we can only do our best. After that, it is up to the choice of the person to let the Spirit in and touch his heart, just as it describes in 2 Nephi 33:2. The spirit will carry the truth unto the heart, but only a willing heart can let him in. I know that Heavenly Father does answer prayers, and I know that if we are listening to Him, he will recognize it. I know that as missionaries, all we have to do is our best, and Heavenly Father sends us an assurance that we have done all we could. Our sole responsibility is to invite others to come unto Christ. Well, that is all for this week. I love you all. A la semaine prochaine! Elder Hall and I had the chance to go on 3 zone leader exchanges this week with one in Lille, one in Strasbourg, and one here in Paris with the elders in the Paris Lilas Zone. They were all very marking for very different reasons, but all enjoyable nonetheless. Starting off with Elder Shafer in Lille. We got there in the middle of a rain storm and despite our efforts to cover ourselves with our umbrellas, the wind was so strong, and blowing from all directions at the same time that we were completely drenched by the time we showed up to the church. The weather has a mind of it’s own during springtime. I guess I was grateful to be in touch with the water, since I haven’t been swimming for quite a while. Well, we fixed some goals and felt like we needed to head to a place in their sector called Roubaix. So we did. We said our prayers at the door and went out with great hopes for the day. We walked and talked to people on the way, and before we knew it, we found ourselves in a pretty deserted estate. We began talking to people on the road, the ones who crossed our paths, and one after the other, they would angrily turn us away. Even while we were knocking doors that day, a random car drove past us, wound down the window, and a lady in there yelled at us to get out of their area. We decided to continue on our way, and laugh, “Well, the opposition here is strong.” Despite the angry people, Elder Shafer and I were able to have really great conversations with people, teach 3 lessons on the street, find a couple of new investigators and see some miracles. We always have to get through some dirt to find the gold. Elder Amaya then came on an exchange with me in our sector here in Versailles. Elder Amaya had a really touching story of coming out on a mission. He was 13 when the missionaries first knocked on his door in Honduras and at the time, though he was young, he had thought a lot about his purpose in life, given the difficult situation that his country was in, so he let them in. While his parents were atheist, and were not interested, he felt strongly that what the missionaries were sharing was true and decided to be baptized. He eventually went to school in BYU provo and spent 2 years there at school, studying chemistry, and during this time, he also felt that he really needed to serve a mission. However, unlike most of us missionaries who usually have support from home, his parents were strongly against him serving a mission, and threatened to disown him if he were to come, because they thought it would be a huge waste of time. Despite this, he still felt strongly that Heavenly Father wanted him to come on a mission, and has been here since, without any parental support. Elder Amaya and I taught me that day to really appreciate my mission, and to be grateful for the peace of mind that I can have out here. 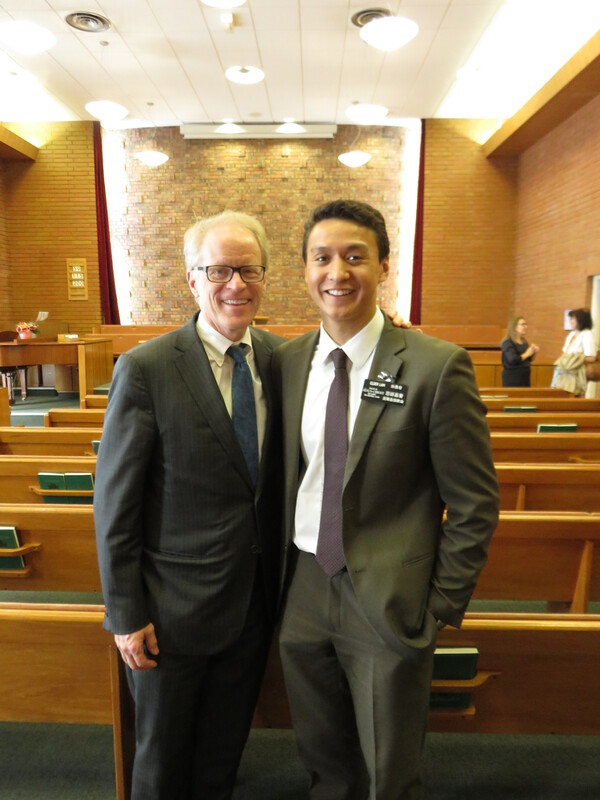 My final exchange for the week was with Elder Ricks, one of the missionaries I admire greatly. He has been one of the missionaries in this mission with a rock-solid determination to find and teach and baptize, and is someone I call, a “game-changer.” Everywhere Elder Ricks has gone, he has been able to make it fruitful because he has always carried with him a strong sense of hard-work and determination. One of the greatest experiences of my week happened during the last 20 minutes of that day. We had just finished teaching an ami of theirs, and decided to head to the park with the remaining 17 minutes we had, just before the last bus home came. We walked through the park nextdoor, and found a chinese father with his little chinese girl who was picking flowers from the garden. Seeing that this was a great opportunity for me to finally use my chinese skills, something I had not used for a while, I talked to him, introducing myself, and to our great advantage, he spoke English too! He told us that he had Christian friends before, and though heard what they wanted to say, never really felt close to Jesus Christ, though he wished he could. We talked to him about prayer, and to our surprise, he had never prayed before! So we taught him how to pray and prayed with him. Unfortunately, however, because we had been talking to him for a while, we ended up missing our bus home, and were going to have to walk home. But, just as we were crossing the street, we saw the last bus come in. It was already 13 minutes past the departure time of the last bus. “How could it be?” we asked ourselves. It turned out that a policeman had stopped the bus earlier down the road, and we were able to hop on the last bus. Heavenly Father helped us catch the last bus! Funny thing, while Strasbourg was probably my favorite exchange and city, there was a church bell next to the Elder’s apartment that went off every 15 minutes, even throughout the night. I probably woke up 15 times that night. I guess everything can’t be perfect. So that was my week. The cherry on top was definitely my mother’s day call. It was so great being able to speak to my family again. I am truly grateful for everything my mother has taught me, especially the principle of diligence and hard work, something that she inculcated in me since my youth. Thanks Mum! I love you very much. Families are forever. Missionary work is the best work one can ever do. I love my Heavenly Father.